I began my nuclear advocacy in November 2010. I spoke to 4 people in a free community venue. I knew them all by name. One of them was my father. My wife baked cakes. As you might imagine, I left with mixed feelings. I had just delivered my now somewhat-seminal presentation Nuclear Power: From Opponent to Proponent for the first time. I thought I had something, but it was an inglorious start to be sure, and I did not know if the issue really had legs. Please share this conference information widely. ATSE have done a wonderful job of keeping costs low. Those with any professional interest in Australia’s energy future must attend. There are also a small number of exceptionally discounted student places. I look forward to seeing the turnout for this important conversation!!! Like what you see? Please subscribe to the blog, Like Decarbonise SA on Facebook and follow BenThinkClimate on Twitter. 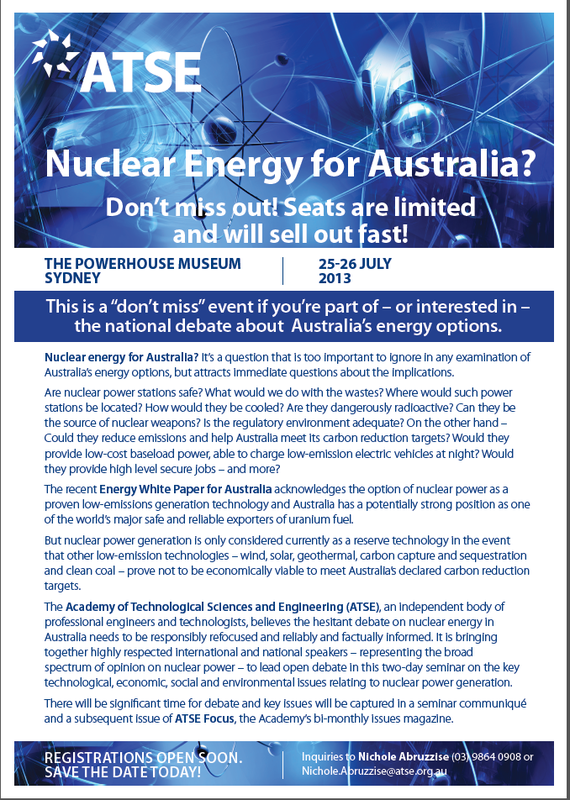 Read more about the potential for nuclear power in Australia at Zero Carbon Options. Professor Ian Lowe can expect a rough reception from some quarters – I hope that those attending keep it civil.Too expensive for a retired chap. The total of travel, attendance and accommodation will be beyond my reach. Will the proceedings be available either in print or electronically?